We need to start doing something about inequality as it is doing it best to damage our society. today the Observer newspaper has a good editorial on this subject that is worth reading. 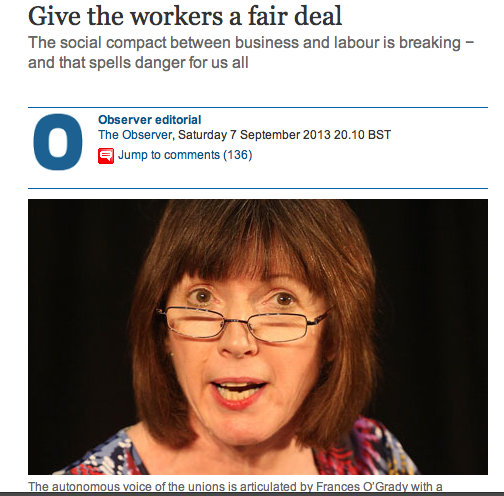 To read this Observer Editorial called “Give the workers a fair deal” follow the link here. Why can’t we seem to tax the rich anymore it has become a policy of all governments to go for the tax dodger and the social security benefit cheaters but the real villains are the rich the ones who have distorted our discussions on taxes and spending so that they do not have to contribute this has been aided by our own misplaced ideas of false consciousness of our class or to put it another way our misconception of where we are in society in real relation to those who earn lots of money. We as a society have to rethink what it means to be a society and start to think about our world differently if we are to make a difference to our lives and that of those that come after us.